Home Operations Diesel and Propane and Gas, Oh My! This content brought to you by Blue Bird. One of the most important decisions regarding a bus purchase is the type of fuel to choose. There is a lot of conflicting information out there today … those that say alternative fuels are not worth pursuing, or that diesel is going the way of the dinosaur. The fact of the matter is, each fleet may operate a different fuel type in order to achieve their best total cost of ownership, or TCO. Propane is a fuel that has gained popularity for many reasons. 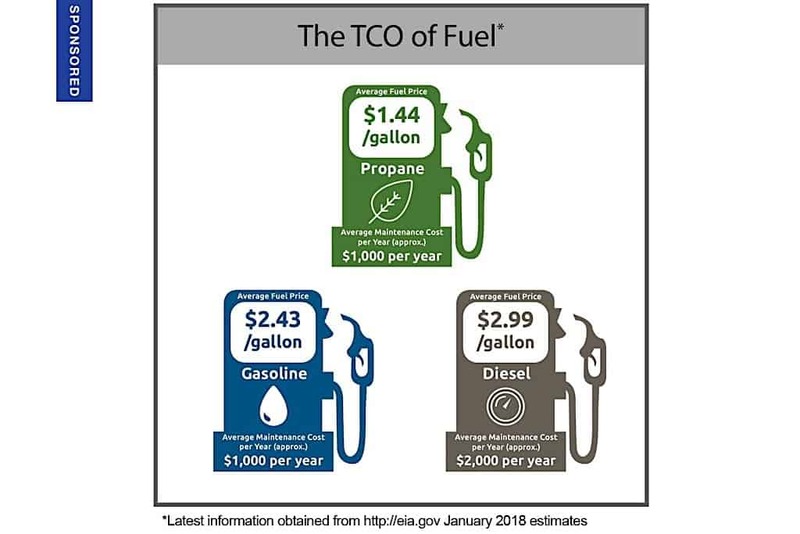 Ninety percent of the fuel itself is domestically produced in North America, making it less expensive when compared to other fuels, such as diesel. The fuel is naturally very clean, and the bus requires no additional parts in order to reduce harmful emissions. The Ford engine that Blue Bird uses for their propane buses is currently the cleanest combustion engine available for school buses today, achieving 0.05 NOx—well under the current EPA emissions standards—and will soon be certified for 0.02 NOx. These buses provide a 60 percent reduction in NOx emissions, an 80 percent reduction in smog-producing hydrocarbons, and a 100 percent reduction in particulate matter. Propane also starts up great in cold weather—operating in temperatures as low as -40 F with no need for additional heaters or additives. Many districts are starting to add gasoline-powered school buses to their fleets. Like its propane cousin, the Blue Bird Vision Gasoline bus is powered by the same Ford engine, and does not require the magnitude of additional parts in order to run clean like a diesel bus does. The Blue Bird Gasoline Vision has the lowest upfront cost, making it a good choice for those who want to save right away. These buses also start-up great in cold weather climates, and the fuel is readily available while travelling—making the bus a great choice for those who do regular field trips or sports outings. Diesel is the dominant fuel for school buses on the market today, making up roughly 80 percent of all buses currently running. Unlike their older counterparts, today’s diesel buses have the ability to “run clean”—meaning they produce far fewer emissions today than they have in several decades. This is accomplished by the addition of Diesel Exhaust Fluid (DEF), as well as many new parts that filter out the majority of harmful emissions.